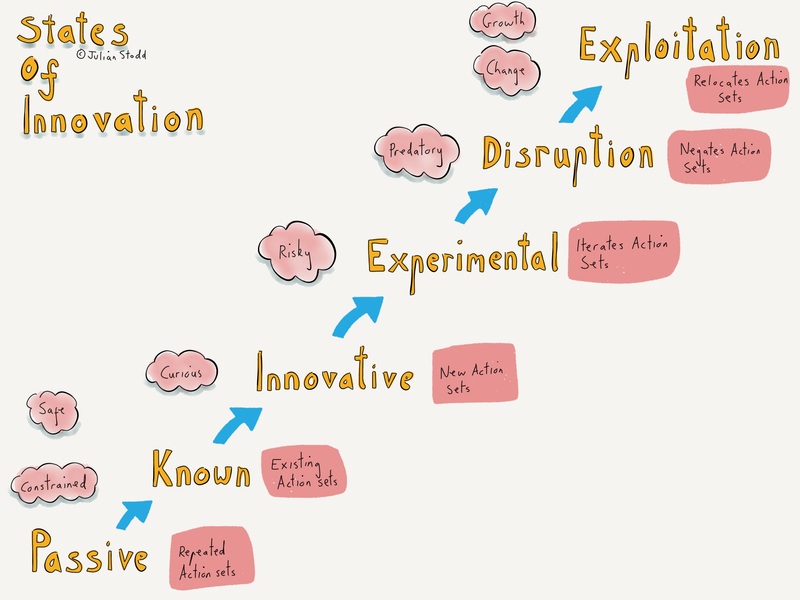 Today, i’m sharing some early work around ‘Innovation’, specifically, six foundational thoughts, and six steps in the process of transforming an organisation to be more able to innovate. I am not developing an innovation process, because i don’t view innovation as a process, but rather my focus is on ‘creating the culture, the conditions, for innovation to be unlocked’. This work draws upon some other strands of my work, specifically the Change work that have been sharing over the last two years, and aspects of Social Leadership and Learning. 1. Innovation can be ‘nurtured’, or ‘provoked’. We need to understand the mechanisms of both, as they relate to internal change, and external disruption. 2. ‘Innovation’ vs ‘Exploitation’. Innovation is an exploratory, experimental state. Exploitation is about optimisation, profit, and scale. They may not be mutually compatible in one culture. 3. Creating an Innovation culture may require wholesale cultural transformation. We must understand the resistors, and amplifiers, of this type of change. 4. What works ‘there’ may not work ‘here’. Observing innovation may not change us, unless we are adept at understanding the foundations of what is happening. This is a core leadership skill. 5. ‘Failure’ and ‘Innovation’: it’s unlikely that innovation is a binary success/failure state, but rather an ongoing ability to refine and iterate. Understanding how this sits in opposition to organisational structure is key to overcoming Constraint. 6. ‘Mindset’, not ‘Process’. An innovation process may work to exploit, but not necessarily to innovate. We must understand the organisational mindset, and see process as secondary to that. And then here are six elements of a framework, intended to show how innovation founders on the rocks of cultural Constraint. It’s about an Organisational Culture that can visualise, explore, experiment, and adapt, to innovation. Within this approach, it’s possible for each manifestation to exist concurrently, resulting in an overall Constrained state. I am starting to prototype this work, so will iterate it fast as it’s grounded in practice, and also some research i’m doing into this cultural formation and flex. So, for now, take it as early stage #WorkingOutLoud. This entry was posted in Innovation and tagged Change, Constraint, Growth, Innovation, Leadership. Bookmark the permalink.